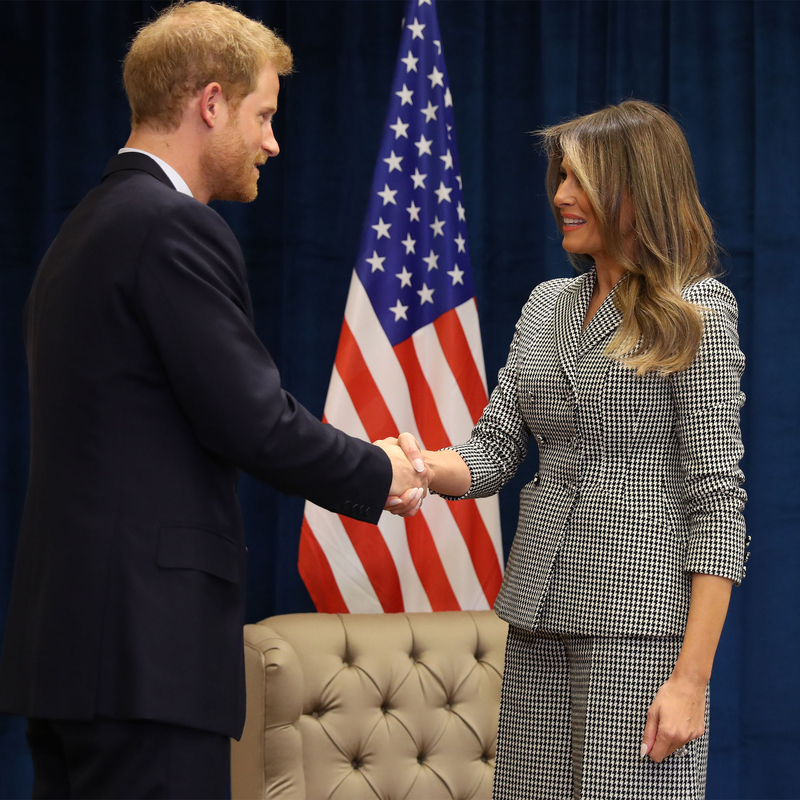 Prince Harry met with First Lady Melania Trump ahead of the opening ceremony for the third annual Invictus Games in Toronto, Canada, on Saturday, September 23. Looking elegant in a black and white checkered suit, the former model, 47, beamed while shaking hands with Harry as they posed for photographers in front of American and Britain flags. The prince looked dapper in a dark navy suit with a maroon tie, and kindly thanked Trump for joining him. The two chatted briefly in front of reporters. This trip is Trump’s first solo trip out of the country since her husband, Donald Trump, became president earlier this year. She is leading a U.S. delegation to the international sporting event. Prince Harry created the Invictus Games specifically for wounded, injured and sick armed services personnel after serving in Afghanistan in 2008. The former army officer came up with the multi-sport event after seeing a British team compete in 2013’s Warrior Games. The first Invictus Games took place London’s Queen Elizabeth Olympic Park in 2014, where several hundred competitors from more than 13 countries took part. The second Invictus Games were held last year in Orlando, Florida, and next year’s games will be in Sydney, Australia. The games begin Saturday night, kicking off eight days full of sporting events that include 12 adaptive sports that will feature 550 competitors from 17 nations. The games will end on Saturday, September 30, with a concert featuring Bruce Springsteen, Kelly Clarkson and Bryan Adams. There has been speculation that Harry will also be making an appearance with another headline-making woman in Toronto — his girlfriend, Suits star Meghan Markle, who shoots the USA network series in the Canadian city.